Okay FINE. We’ll talk about being gay aunts. If you’re realllly going to make us do it and pull out pictures of our nieces and nephews, we guess we’ll oblige. Mila Myles came by to dyke out about her experience being a gay auntie to her sister’s kids, and why somebody should maybe check her when she volunteers to bring them to New York City to look after for multiple weeks! How is being a queer presence in a child’s life different and important? How does it affect that child’s understanding of gender and sexuality? And most importantly, how can you teach them to vogue on your Instagram account??! We also talk about the whiteness of Portland, Oregon and Hulu’s Shrill, which leads us into a discussion about the gentrification of Brooklyn and how white people trigger anxiety. As always, we end with a question from a listener who shows up to DRAG Sarah! 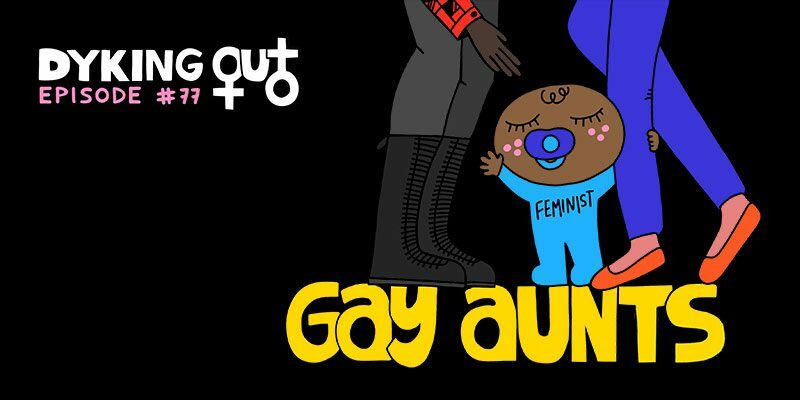 Listen, and then tag us in your #gayaunt pics! -Come to Dyking Out at Stonewall in NYC on Monday, April 29. Tickets here! -Keep the podcast a-lez and gay by donating to our Patreon, where you can get some sapphic swag. -For related content, follow us on Twitter, Facebook, Instagram, and Leave Us a Review if you like what you hear! For our 50th episode, the incredible Tara Clancy (NYT, NPR’s Wait Wait Don’t Tell Me, The Moth) joined us to talk about Carolyn’s favorite topic: Divorce! Okay, maybe it’s not her favorite topic, but it was nice to have another divorced dyke to commiserate with. We talk about the external pressures that make you feel bad about ending your marriage, even when it’s the best thing for everyone involved. How do things get to that point? How do you move on? What do you do when children are involved? Are vacations to National Parks the beginning of the end for queer couples? We also take a listener’s question about her “friend” who she swears isn’t her, but we’re not buying it! Comedian Lucas Connolly (Seeso’s New York’s Funniest Comedians) has FOUR gay moms, so we overlooked his affiliation with the patriarchy to have him come on the show and dyke out about his upbringing. We knew Lucas had a lot of moms, but what we didn’t know is that one of them is a well-known LGBT activist and politician (research fail)! We had so many questions, like what’s it like growing up in a queer household in Laramie, Wyoming, how did this affect his dating life, and what does he do on mother’s day??? But before we dig into gay mom territory, Carolyn talks about seeing Janelle Monae live, and Sarah wants the New York Post to LEAVE BRITNEY ALONE!!! Plus, we take a question from a listener who wants to explore the world as a lesbian, but her boyfriend is not onboard. -If you’re in NYC on August 6, come to Queer Film Theory 101 at House of Wax Bar to see Carolyn dissect all of the queer subtext in the movie My Girl. Three cis-gendered queer women without kids walk into a podcasting studio to talk about challenging gender norms and raising children. What could go wrong? 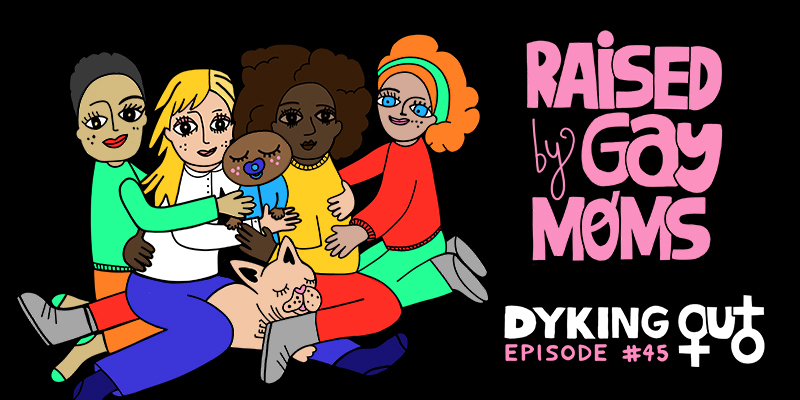 Comedian and child-caregiver Caitlin Ruppert joins us to talk about why we need to stop shaming and correcting kids who act outside of gender norms. Also, who decided that trucks are for boys anyways when, newsflash, women are allowed to drive them too (at least in this country). Are gender reveal parties strictly a straight person thing? Why are people obsessed with the romantic lives of babies? (It does sound a little bit adorable…) We also talk about the terrible people who love forcing other to drink shots. If that’s you, KNOCK IT OFF. Keep the podcast a-lez and gay by donating to our Patreon, where you can get some sapphic swag. For related content, follow us on Twitter, Facebook, Instagram, and Leave Us a Review if you like what you hear! 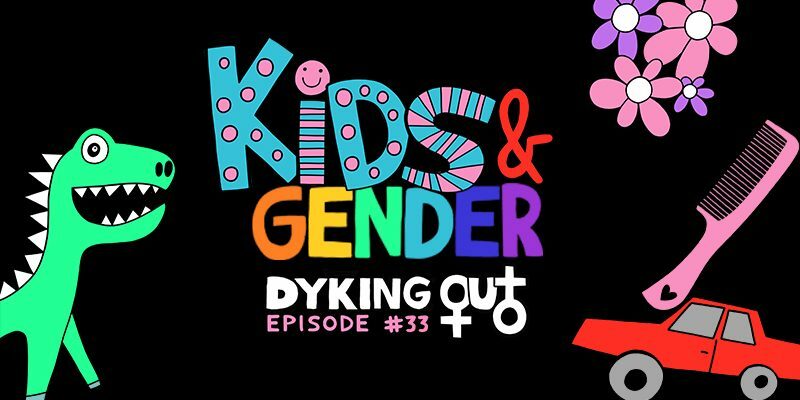 Hosted by New York City-based comedians Carolyn Bergier and Sarah York, Dyking Out is a podcast about lesbian / queer life, news, and pop culture as told by a couple of dykes. 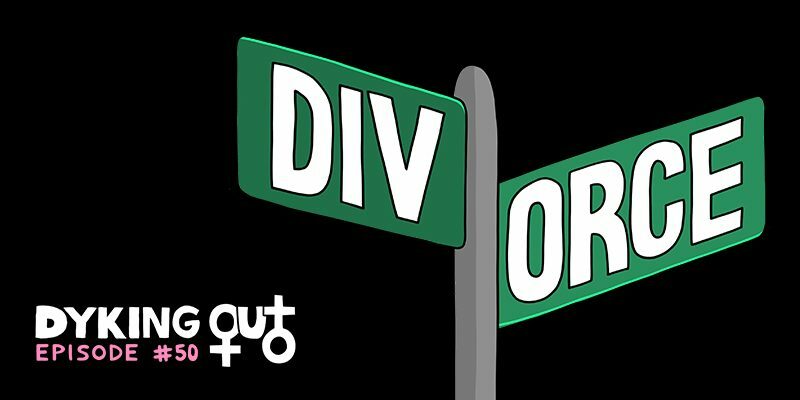 Each week, Carolyn and Sarah invite a special guest (comedians, musicians, academics, scorned ex-lovers) to dyke out with them about a topic that’s relevant to the LGBT world. But really, it’s just another way to advance the gay agenda.